Local shares rose for the third straight day yesterday, buoyed by higher oil prices and an upbeat assessment of the United States economy in a Federal Reserve report. Easing tensions over Syria and North Korea as well as broadly positive corporate earnings in the US also boosted investor sentiment. 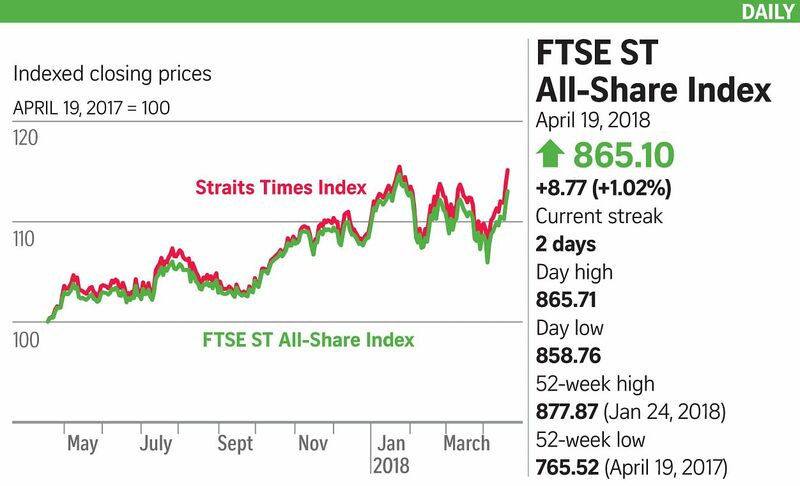 The key Straits Times Index jumped 40.91 points, or 1.15 per cent, to 3,598.73. Its regional peers also enjoyed gains across the board with shares in Japan, China, Hong Kong, Taiwan, South Korea, Australia and Malaysia closing higher. US stocks finished mostly higher overnight on upbeat corporate earnings and a surge in energy stocks, but the Dow Jones Industrial Average closed marginally lower, dragged down by IBM's disappointing outlook. The Federal Reserve noted that robust business borrowing, rising consumer spending and tight labour markets signalled that the US economy was on track for continued growth, but it also highlighted tariffs and trade war risks. Oil prices extended their gains following data on falling crude inventories and optimism over the global economy. While the elimination of oversupply is a critical factor pushing up prices, FXTM chief market strategist Hussein Sayed said a "significant risk premium" was being priced in, specifically the fear of supply disruption from the Middle East and possible renewed sanctions on Russia and Iran. Turnover here came in at 1.6 billion shares worth $1.4 billion, with gainers outpacing losers 243 to 182. Gains were led by banking stocks, with DBS and United Overseas Bank both up 1.9 per cent, while OCBC Bank added 1.6 per cent. Ezion Holdings once again topped the most active list, with 92 million shares worth $16 million traded. The counter extended its losses since it resumed trading on Tuesday, slipping 0.5 cent to 17.2 cents. Noble Group retreated 0.8 cent, or nearly 7 per cent, to 10.8 cents. The embattled commodities trader buckled under pressure from criticism of its debt restructuring proposal and said it would drop a provision from its proposal that penalised shareholders voting against the plan. ComfortDelGro added eight cents, or 3.7 per cent, to $2.24. The transport giant said yesterday it was expanding its British operations in a £1.2 million (S$2.2 million) acquisition of London taxi circuit operator Dial-a-Cab.